Many animals were taken to war to assist the soldiers’ efforts. 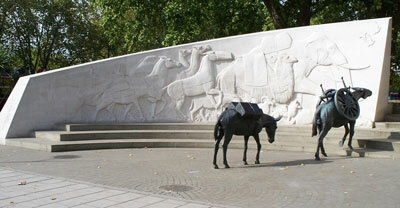 The image below shows the memorial in London’s Hyde Park dedicated to all the animals that suffered and died in the wars and conflicts in the twentieth century. As well as the work undertaken by horses during wartime, what other animals do you think may have played important roles? Why do you think we build war memorials such as this one in Hyde Park? What other war memorials do you know of? Are there any near where you live? Joey’s story is based on the real life experiences of many horses taken to work for the army during the First World War. This worksheet will encourage you to think about how we remember the soldiers who died during the First World War and other wars that have taken place since. Does anyone in your family have a military connection? You could talk to your parents, grandparents, teachers and family friends about connections they have to people who died in either the First or Second World Wars. What can you find out about them? Can you get photographs, diaries, letters or postcards that give us profiles of these people? Find out about your area and how those who died in world wars have been remembered. Go to www.ukniwm.org.uk to see if there is a war memorial near where you live. If so, take a picture of it and see if you can find out anything about the people it commemorates. Using your findings, create a display in your school about the importance of remembrance. Think about the significance of War Horse in keeping alive the memory of those who died during the First World War and think about how you can include elements of the film to enhance your display.